Use a sharp knife to peel the pumpkin, cutting it into pieces to allow you to get better angles. Once the pumpkin has been cut into small cubes, roughly 1cm by 1cm, add the butter to a large non stick frying pan, preferably with a fairly thick base. When the butter melts, add the pumpkin and garlic and saute on medium to low heat for about 5mins, stirring regularly. Add the rice and the sage and stir for a further 3 minutes, until the rice gets a bit glassy. Add the wine and stir regularly until the wine has mostly been absorbed. The mixture should look something like the picture here at this point. 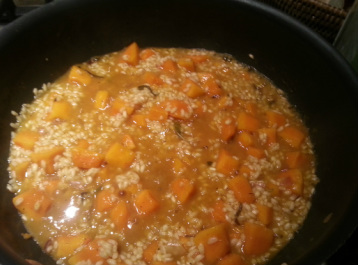 Then add enough stock to cover the rice mixture, and keep stirring regularly until this liquid is mostly absorbed. Repeat this step until all the stock has been absorbed. This should take roughly 20 mins, and the rice should taste well cooked and soft when complete. When the last bit of stock has just been added to rice, put a small non-stick frying pan on another hub and lightly bake the tofu slices, so they are warm when served. Only a minute or two on each side is required. When the stock has been absorbed, turn the hob off and allow to cool slightly. Add pepper to taste. Serve the risotto with grated cheese on top, and a generous handful of rocket and the smoked tofu on the side.